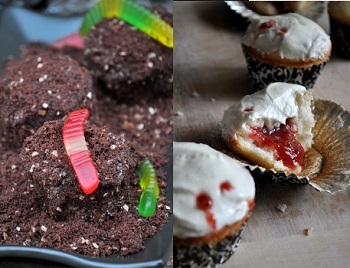 Halloween is the perfect holiday to play with your food and I try to take full advantage of that by coming up with creative, delicious desserts that are both a trick and a treat! My Vampire Cupcakes are a great example of a spooky snack that is a lot of fun to make and even more fun to eat. 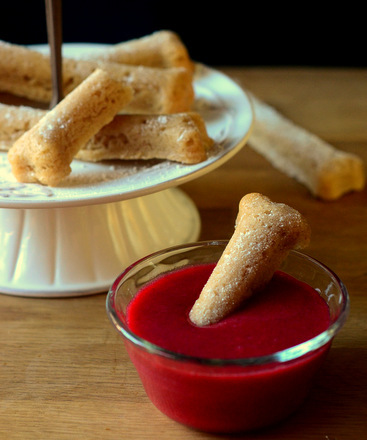 These Cinnamon Cookie Bones and “Blood” Dipping Sauce will also make a fantastic addition to the dessert table at Halloween parties this year. 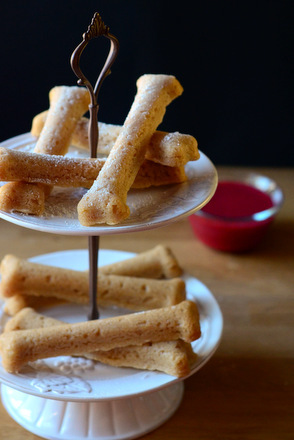 The buttery sugar cookies are shaped like bones and served with a gooey-looking raspberry sauce that compliments them, both in looks and in flavor, perfectly. 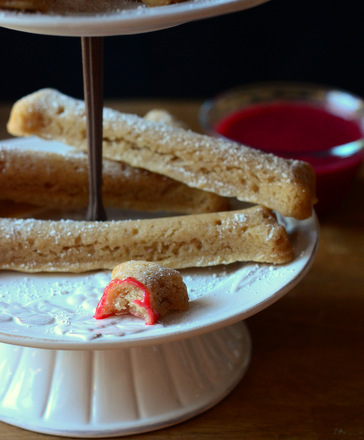 The sugar cookie recipe is a very basic one that is flavored with cinnamon, vanilla extract and almond extract. It has a nice hint of spice that compliments the buttery cookie base, and the cookies bake up to be crisp on the outside and slightly chewy inside. Â You’ll notice that the cookie dough is made without any leavening agents and this is on purpose. The cookie dough needs to be molded for this recipe and it is important to have a dough that holds its shape during baking. I made these cookies using Wilton’s Bone Cookie Pan, a nonstick pan that has six bone-shaped cavities. The pan is perfect for making Halloween-appropriate cookies, though it can be used year round (especially if you bake dog biscuits!). 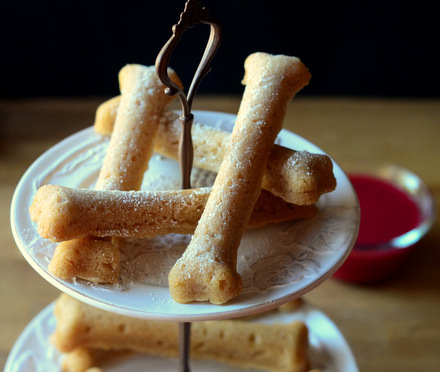 The recipe makes enough for 24 of the bone cookies, which are fairly large, and you’ll need to wipe down and reuse the pan for each batch, unless you have multiple pans. If you don’t have a cookie pan, you can hand-shape these cookies (tutorial coming soon) and bake them on a regular baking sheet. The hand-shaped cookies will have a slightly different look to them, however they’ll still taste just as delicious and they’ll be just as much fun to serve. The dipping sauce is a fruit puree made with fresh raspberries and sugar that is then strained to remove the seeds. Raspberries have a vibrant red color that makes the sauce look bloody (especially in a dimly lit room!) without the need for any additional food coloring. They also have a sweet-tart flavor that really works well with the cinnamon in the cookie bones. The puree can be prepared in advance and stored in the refrigerator, in an airtight container, for 2 days before serving. The cookies can also be prepared an advance and stored for at least 2-3 days. Also, the cookies are a light tan color after baking, thanks largely to the cinnamon in the dough. If you want your bones to look whiter, simply dust them with a bit of confectioners’ sugar before serving. Preheat oven to 350F. Lightly grease a Bone Cookie Pan. In a medium bowl, whisk together flour, salt and cinnamon. In a large bowl, cream together butter and sugar until light and fluffy. Beat in egg, vanilla and almond extract. With the mixer on low speed, gradually blend in the flour mixture. Dough will seem dry, but it will come together with continued mixing (3-5 minutes). Dough should be quite dry and easy to handle after it comes together. Press dough into cookie pan cavities, filling the bones about 3/4 full. Bake for 10-12 minutes, until cookies are light golden on the top. Allow cookies to cool in the pan for 10 minutes, then gently turn them out onto a wire rack to cool completely. When pan is cool (pan will cool very quickly), refill with dough for the next batch. Makes about 24 cookie bones. 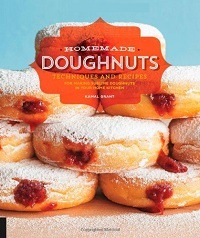 In a food processor, puree the raspberries with the sugar until sugar is completely dissolved. Strain through a fine mesh strainer to remove seeds. Serve with cookies.